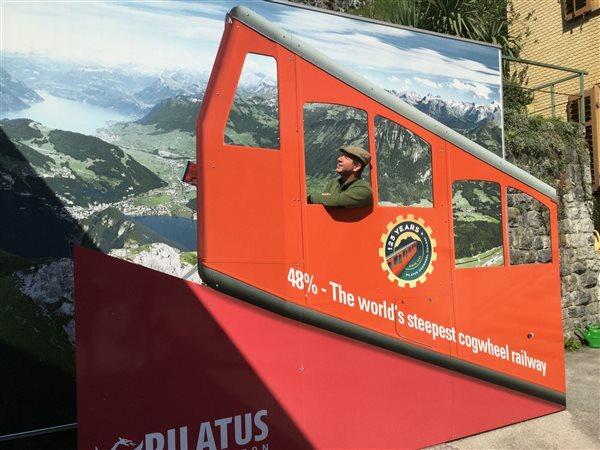 LUCERNE, Switzerland — Unable to hop out of the Pilatus Bahn cog railway cars to get a better picture, I opted to show you an approximation of what it was like to ride the Pilatus near Lucerne today. Please accept my apologies. 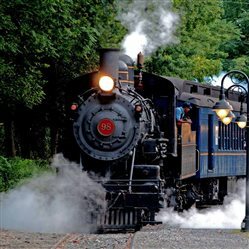 The picture above does the railroad some justice. But man, oh man, there’s not a stick of what you might call tangent track on the entire line. It’s simply “up” and “down”: On curves, through tunnels, over stone arches, and next to more brown Swiss cows. As a railroad, Pilatus is an engineering marvel — winning an award from American mechanical engineers in 2001. From its summit, you can see snow capped peaks to the west, which must have contained the Jungfraujoch, but you can also pick out Lucerne and surrounding cities. The most interesting facet of this line, to me, is not its maximum 48-percent gradient, but the way engineers designed the cog system: with two cog wheels on opposite sides of a central bar that propel and stop the train. And the train is efficient, moving passengers from base to summit in about 30 minutes.